Very Good. 208 p. Penelope, wife of Odysseus, is portrayed as the quintessential faithful wife. She is left alone for twenty years when Odysseus goes off to fight in the Trojan war. When Odysseus finally returns, he kills all her suitors and curiously, her twelve maids. This book features a retelling of "The Odyssey", with a contemporary twist. I like Atwood, particularly her poems. This book was pretty terrible. Under the guise of exloring the myth of Penelope from the womans' perspective, it rendered Penelope as impotent as characterised modern housewife home reading glossy mags. In fact a glossy mag tone seemed to pervade the book, and little stabs at poetry through the chorus were oddly terrible. Like a different author intirely. Sad, but I am staying away from Atwood for a while after that. Margaret Atwood is and will remain one of my favorite writers, and her retelling of the myth of Odysseus and Penelope, titled "The Penelopiad," is a great illustration of why. Her prose here is, as always, innovative and alive. Penelope, our narrator, grabs the reader immediately with her confessional tale, and I could barely put the book down. Told from her home in the fields of asphodel in 21st century Hades, Penelope reflects on the events of the Odyssey as well as the newfangled happenings in current society. She is most troubled, after all this time, of the hanging of her twelve maids by her husband and her son after they had slaughtered the treacherous suitors. The killing of the suitors made a certain amount of sense; they had pressed her to forget Odysseus and choose a new husband, eating up the wealth of her kingdom and plotting against the life of her son. But the maids were slaves whom she had raised from girlhood, and even in death their murders hang heavy on her soul. As she recounts her side of these famous events, the maids act as a sort of Chorus, interjecting every other chapter with admonishments and questions that take many different forms: poems, songs, jump-rope rhymes, even an anthropology lecture. This slim volume is well worth reading and is a brilliant insight into a character known almost entirely for being the single adjective, "Faithful." Penelope tells the story of Odysseus from her personal perspective from the grave. That seems to be the only venue from which she can honestly vent her own opinion. 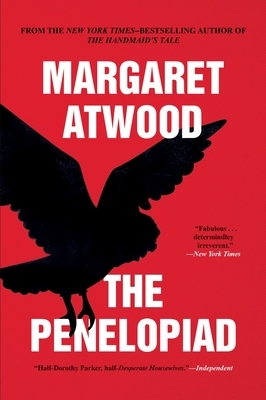 Atwood brings research and wry humor to poor Penelope's pathetic life. We learn about her parents, her upbringing, her relationship with her sister, the arrogant Helen, and her lonely life from the moment she bears the heir, Telemachus. Like many military wives, Penelope must manage the homefires alone, but with Odysseus's old nurse bustling about and usurping any power or identity Penelope might have, and a mother-in-law who dislikes her, she does not even have the recognition as the Lady of the Manor at best or as proud Chatelain at least. Although she understands the reason for the slaughter of the importunate suitors, Penelope remains puzzled about the reason for the hanging of the twelve maids, her only friends and confidants in a hostile environment far from her home. The reader continues to hope for a happy ending, but that is reserved for the hero, not Penelope.